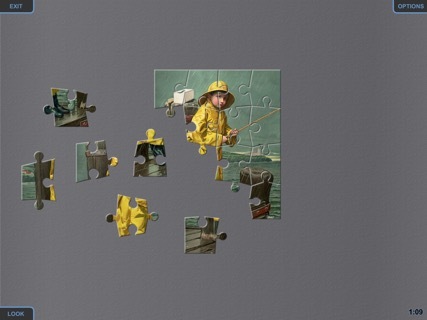 Put together jigsaw puzzles on your iPad! Choose from a variety of images, then decide the number of pieces. You can alter the background and the appearance of the pieces as well. Comes with 15 free puzzles, plus the ability to play a daily puzzle or use images from your photo library. You can also add any of six collections featuring 50 beautiful images specially chosen to make great jigsaw puzzles. The jigsaw puzzles snap together easily just by dragging them across the screen with your fingers. You can play puzzles that take only minutes to solve, or cut the image into small pieces for more of a challenge. 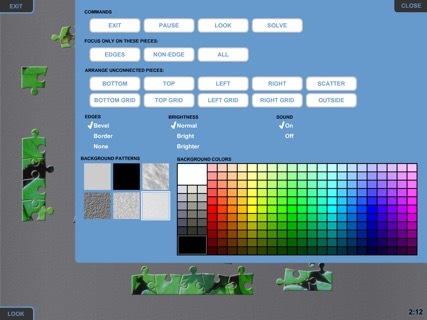 You can also use handy arrangement commands to move the pieces around and work with only edge pieces or middle pieces. • Choose whether you want a small number of large pieces or a large number of small pieces, or anything in-between. • Set the piece edges to appear beveled, with a dark border, or no border. • Change the background color and pattern. • When you exit a puzzle, the game remembers the positions of the pieces and you can resume playing later. • Checkmarks show you which puzzles you have completed, and three dots show you which ones are in progress. • Play the daily puzzle from JustJigsawPuzzles.com for free. 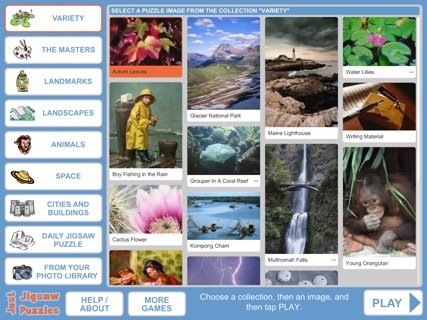 • Choose any image in your photo library and play it as a puzzle for free. You can use pictures you take with your iPad's camera, or anything you import including photos from your computer. • Arrange unconnected pieces off to one side, or focus on only the edge or non-edge pieces. • View the full image as a small moveable window on the screen to help you figure out where the pieces go. • Includes a quick start video to teach you how to play. • Get more puzzles to play by adding collections: The Masters, Landmarks, Landscapes, Animals, Space and Cities and Buildings. 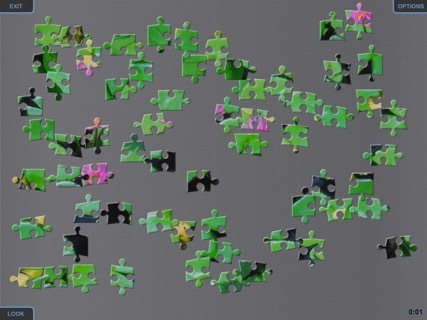 Each collection includes 50 beautiful hand-picked jigsaw images.